"Isn't it amazing that all of this came out of that little book?" 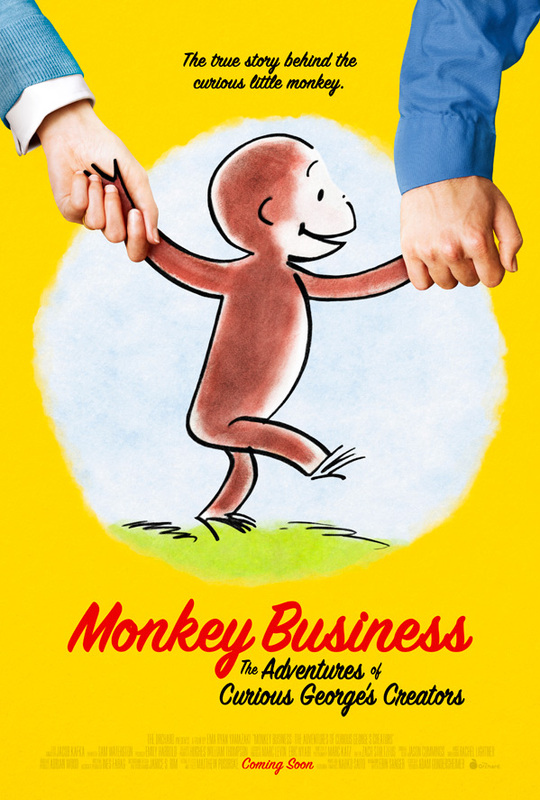 The Orchard has revealed an official trailer for the documentary titled Monkey Business: The Adventures of Curious George's Creators, telling the story of the creators of everyone's favorite little monkey, Curious George. Created by Hans and Margret Rey, they eventually had to flee from Paris at the beginning of World War II to escape the Nazis, and they were luckily able to smuggle out the first manuscript of what would become the very first Curious George book. The doc tells their story, not only escaping the Nazis, but also how they came together and originally envisioned the idea for the beloved children's books. Monkey Business was successfully got funding on Kickstarter in 2016, and will be released this month for anyone excited to watch this. Featuring narration by Sam Waterson, and adorable animated scenes, this looks like a good watch with the whole family. Enjoy. Curious George is the most popular monkey in the world. Since his introduction in the first publication in 1941, the beloved series has sold over 75 million books in more than 25 languages. Monkey Business explores the lesser-known tale of George's creators, Hans and Margret Rey. Originally from Hamburg, Germany, the Reys first met when Hans was dating Margret's older sister. Years later, having heard that Hans was wasting his artistic talents as a bookkeeper in Rio, Margret traveled to Brazil to persuade him to marry her and do something creative together. After their four-week honeymoon to Paris turned into a four-year residency, they accidentally became children's book authors when a publisher suggested they create a book out of a cartoon Hans had drawn. Being German Jews, however, their life in Paris abruptly came to an end in June 1940 when the Reys were forced to escape from the Nazis on makeshift bicycles – a manuscript of the first Curious George book was one of the few possessions they could smuggle out. Arriving in New York as refugees, they started their life anew and over the next three decades they created a classic that continues to touch the hearts and minds of children around the world. Monkey Business is directed by filmmaker Ema Ryan Yamazaki, making her feature debut after a few other short docs. The Orchard will release the doc direct to streaming/VOD starting August 15th this month. Anyone interested?